The sales growth of pint-sized SUVs seems to have become stunted in 2017 despite an expanding category, yet they still account for about 10 per cent of Australia’s new-car market. Two of the top-sellers can’t be accused of resting on their laurels, either. Both the Holden Trax and Mazda CX-3 have been given notable updates this year. Mazda’s smallest SUV has received its first change-up since its 2015 debut; while Holden’s SUV entry point gets its second update – but first design facelift – since it was released in August 2013. Several trim grades are available for each, but here we pair the Trax’s most popular variant, the entry-level LS auto, with its price equivalent, the CX-3 Maxx FWD auto that’s one grade up from the base Neo and also the range favourite with buyers. 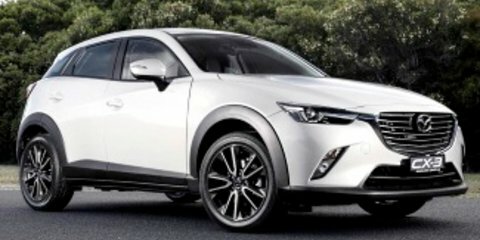 In the vast and complex CX-3 range, the Maxx FWD petrol auto couldn’t be more of a sweet-spot: of all CX-3 buyers, the Japanese brand says 55 per cent opt for the Maxx, 85 per cent opt for front-wheel drive over the $2000-extra all-wheel drive alternative, 97 per cent go for petrol rather than diesel, and 89 per cent choose an auto over the standard manual. LS also gains disc brakes at the rear in place of the old-school drums (though auto only), Apple CarPlay and Android Auto smartphone-mirroring technology becomes standard, along with projector headlamps and daytime running lights. No changes to the styling of the Mazda CX-3, but it didn’t need any. This remains an immensely stylish little car. The Maxx has increased in price along with other models, though the extra $500 doesn’t alter the Mazda’s immediate $1400 advantage thanks to its $24,890 sticker ($22,890 for the manual). And it’s essentially a $1950 gap, because Holden charges $550 for metallic paint where Mazda makes its standard (with exception of the popular Soul Red). All CX-3s offer the new standard addition of autonomous emergency braking (AEB) forward and reverse, while the Maxx adds blind-spot detection and rear cross-traffic alert that (along with AEB) were formerly part of an $1030 Safety Pack. AEB isn’t available for any Trax, while you’d need to step up to the $30,490 LTZ to get the other active safety features. The Holden alone offers hill descent control, though this should be put into the context of these two variants being front-wheel drive. Otherwise, commonalities are cruise control, keyless start, rear sensors and rear-view camera, 16-inch alloy wheels, leather steering wheel, cloth seats, and 7.0-inch touchscreens. The Trax has had a 7.0-inch touchscreen since its release, though iOS and Android smartphone displays can now be channelled via Apple CarPlay and Android Auto – making the Holden one of the rare models in the segment to feature these. When not using them, however, Holden’s MyLink setup seems to have taken a visual step backwards. The display was always the most contemporary feature of the Trax’s cabin, though it’s now at the centre of a sweeping fascia design – incorporating orange contrast stitching – that addresses the uninspiring dash of old. Other successful moves to create a more upmarket feel include a more mature instrument cluster (though the digital speedo is lost, disappointingly), and the heating and ventilation controls, as well as the gearlever surround, switching to a glossy-black plastic that also looks more upmarket. The dash top also looks cleaner with the removal of the little storage compartment. There’s still a big dosage of hard, cheap-feeling plastics throughout the cabin, however, and it makes the CX-3’s interior feel more premium. Many of the Mazda’s materials are also rigid, yet the variety of texturing and patterns creates a greater feeling of expense. The gloss black/red circular vents add a particularly smart touch, as does the MZD Connect infotainment system via both its intuitive console-based control dial/joystick (complete with nifty little palm rest) and graphically excellent menu system. This, however, emphasises the last-decade look of the navigation maps. The MZD controller also pushes the central cupholder and storage tray into a slightly awkward position for the driver’s left hand. There’s a handy sloped storage area, with grip mat, ahead of the gearlever, and includes two USB ports (to Trax’s single), 12-volt socket, and SD card slot. Door bins take large bottles, and the glovebox is well sized. The CX-3’s practicality just about ends there. Rear-seat legroom is super-tight for adults, while the shallow rear glasshouse adds to the claustrophobic setting. At least forward vision is excellent, and the rear bench is angled upwards slightly so you sense sitting in it rather than on it. A tiny boot that doesn’t fit a normal-sized pram confirms this is a model aimed more at singles or couples looking for a more stylish-looking city-sized vehicle (with a fractionally elevated ride height), rather than those hoping for a family-friendly SUV for just $25K. There’s a double floor, and the rear seats split-fold (60/40) flat, but you sense Mazda designers won the day against their packaging counterparts during CX-3 development, because most rivals offer more space with similar dimensions. That includes the 4257mm-long Trax, which is 18mm shorter than the Mazda. You can fit more in the Holden’s boot, even if it’s 357-litre capacity is smaller than your average small-car luggage compartment – and it comes with a tyre inflator kit whereas the CX-3 is equipped with a temporary (steel) spare wheel. Trax’s rear aperture is wider and taller, and a low loading lip runs almost flush to the cargo floor for easier loading of bags or boxes. The boot also includes a storage hole, integrated shopping bag hooks, and four tie-down points, and it too extends to a larger, almost-flat floor via folding (60/40) rear seats – but differently, via squabs that lift forward to store vertically in the footwells. When in their normal position, those cushions provide good under-thigh support and the Trax, despite a 15mm-shorter wheelbase, offers more foot space and knee room than the CX-3. Headroom is also better, and the rear also features a proper plug socket. The door bins are shallow and narrow, though, and the moulded bottle holder isn’t that deep. On a build quality point, the CX-3’s doors and tailgate shut with a satisfying thunk; the Trax’s sound rather tinny. 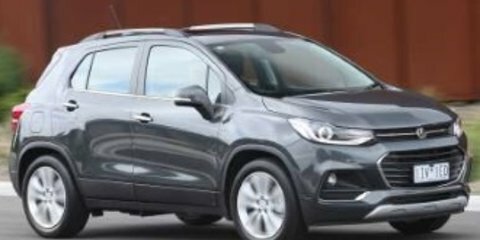 For buyers still chasing the typically high seating position of SUVs despite these downsized versions, the Trax is the only model here that will tick that box. The CX-3’s ground clearance is a mere 8mm higher than the Mazda 2 city car upon which it is heavily based. The more car-like driving position is welcome on tight, twisty roads, though, because the Trax leans heavily through corners in comparison. The Mazda always feels terrifically balanced, its brakes inspire confidence where the Holden’s are a touch too sharp, and the chassis improvements for 2017 have made progress. Where we would have once directed CX-3 buyers to all-wheel-drive variants if they wanted the best (crisper) steering, the front-drive CX-3’s helm has found a consistent smoothness previously lacking. There’s also G-vectoring Control that adjusts the torque delivery to the front wheels for improved cornering balance – a feature that CarAdvice has verified as having a subtle but detectable difference after a back-to-back test. And the CX-3’s switchable Sport mode enlivens the engine and serves up an auto that provides uncannily timed downshifts. The Holden’s gearbox doesn’t even feature a L(ow) mode, while its thumb-controlled manual switches on the gearlever are horrible to use. The result is a struggle to escape turbo lag. The Trax is more composed on flowing roads, and the 1.4-litre turbo and auto combination is more effective when not being hurried. Both drivetrains perform well around town. The Holden’s proved to be the more relaxing on longer country/freeway drives. Where the CX-3’s auto tends to downshift on an incline, the Trax’s six-speeder comfortably holds a gear. The key is its maximum torque. Although it’s only a little more than the CX-3’s 2.0-litre – 200Nm v 192Nm – it’s produced at 1850rpm where the Mazda’s doesn’t peak until 2800rpm. Relaxing is just not the word you would use to describe the Trax’s ride. Both models have an underlying firmness, yet while the CX-3’s damping is generally excellent, the Trax picks up bumps that hadn’t seemed to exist on the same stretch of road driven in the Mazda. At its worst, at country road speeds, it jostles occupants uncomfortably. If that was a surprise considering the Trax’s suspension was tuned locally by Holden’s hugely talented engineers, so was NVH (noise, vibration, harshness) testing. Noise has been an almost constant Achilles heel for Mazda (pick any model), yet the extra sound-deadening measures introduced for 2017 are another update success. Whether considering wind noise or tyre roar, the Trax was noticeably louder. It wasn’t just a trick of the ears, either. According to a decibel-meter smartphone app we used, the Trax averaged 88.4 decibels along a country road compared with 83.7dB for the CX-3. When it comes to the biggest vehicle ownership cost – depreciation – there’s relatively good news for buyers of either the Trax LS or CX-3 Maxx. Small SUVs are generally performing well for residual values, and the Holden’s 52 per cent is a fraction higher than some of its key rivals, while the CX-3’s excellent 56 per cent tops the resale chart along with the equivalent Toyota C-HR. Mazda has traditionally been one of the more expensive mainstream brands when it comes to servicing, and its individual check-ups are indeed higher than the Trax’s. However, the CX-3 can be cheaper to service depending on usage. For example, if you typically drive less than the Australian annual average of 15,000km, Mazda’s ‘Every 12 months or 10,000km’ program will cost $1486 over five years compared to $1923 for the Holden – which stipulates nine-month-or-15,000km intervals. Holden’s plan is advantageous if you drive a lot. Its longer distance intervals mean you can get to 50,000km for a total servicing cost of $747 – less than half the amount owners would incur reaching the same odo figure in the CX-3. Fuel costs favour the Mazda. The CX-3’s official consumption of 6.1 litres per 100km is ahead of the Trax’s 6.7l/100km, a difference that expands on the urban cycle: 7.6 v 8.7L/100km. And petrol can be regular unleaded for the CX-3 where Holden recommends premium for the LS auto’s turbo engine. Holden swings things back in its favour when it comes to warranty. The Trax comes with a five-year/130,000km warranty plus five years’ roadside assistance. Mazda offers only a three-year warranty, and roadside assistance costs $68.10 per year for the standard service, or $83.50 per year for the premium service that adds vehicle recovery, accommodation, taxi, and rental vehicle. Firstly, if you’re remotely considering one of these for family purposes, you’re better spending similar money on, respectively, a Holden Astra or Mazda 3 hatchback, which are roomier and more practical. Or on the packaging marvel that is the rival Honda HR-V. Sales figures clearly indicate, however, that plenty of Australians are buying into the compact-SUV segment for a parking-friendly urban runabout that offers more adventurous styling than a city car and, of course, that elevated view of the road. CX-3 sales aren’t hindered by its omission of the second element, and it has much to offer beyond its visual showroom appeal. It’s always been fun to drive, though the 2017 update has improved the front-drive variant’s steering, and the quieter cabin is just as appreciated. Strong resale, a smart interior, classy infotainment system and a solid drivetrain are further plusses that for many will easily offset the CX-3’s shortage of space. The Holden Trax is a bit more practical and it too brings some good changes for 2017. We’re big fans of the new front end styling, and the interior’s design revisions were much needed. That 1.4-litre turbo isn’t perfect by any means, but it serves the LS auto better than the former 1.8-litre. The Trax’s cabin, however, still lacks the polish of the new-generation General Motors interiors we’re seeing in the latest Opel/Vauxhall product (such as the Astra), ride quality is average, there are mixed results on the connectivity front, and ultimately the Holden looks expensive here by costing more yet missing out on the CX-3’s genuinely helpful active safety features. The Mazda CX-3 Maxx wins here, though as we continue our wait for an outstanding performer in the compact SUV category it’s also worth checking out the base-model versions of the Honda HR-V and Toyota C-HR.